We are proud to announce that this year was a record-breaking year for our Scruff 4 Schools campaign. Last year, Scruff 4 Schools provided 10,215 meals through the annual initiative. Our Scruff Squad went into November wanting to make it bigger than ever before, and it has been amazing to see Nebraska communities rally behind this cause. With over 7,141.8 pounds of food collected in combination with monetary donations raised, the total meals provided that will feed Nebraska kids is…26,354! 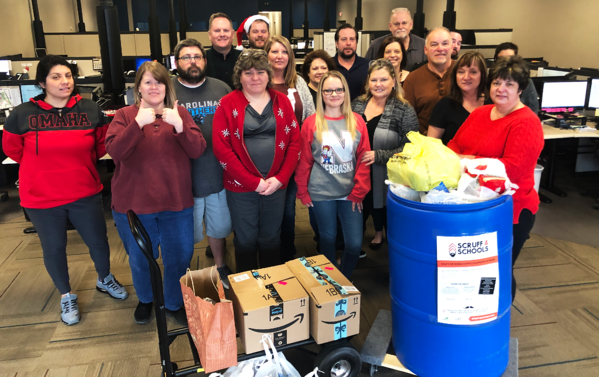 The results above would not have been possible if not for every single Five Nines partner whose teams proactively collected nonperishable food items and monetary donations in their offices. From the bottom of our hearts, we want to thank every single individual who participated. We would also like to thank everyone who participated in the Scruff 4 Schools Driving 4 Donations campaign. Our Scruff Squad camped out at the Kearney, Grand Island, Columbus, and Omaha Hy-Vee's throughout the month in an attempt to collect even more nonperishable food items. We'd like to thank Kat 103.7 and Hits 106 for helping to raise awareness for the Hy-Vee events, as well as anyone who was shopping at those locations on those days who was kind enough to donate. We would also like to thank the Food Bank of Lincoln and the Food Bank for the Heartland for their Scruff 4 Schools partnership, and for giving us the amazing childhood hunger programs that we are able to support. Every single donation in this campaign made a huge difference in these children's lives. Finally, Five Nines would like to take a moment to thank the team at H&M Trucking for their inspiring donation to Scruff 4 Schools. The team at H&M Trucking alone rallied together to collectively raise $4,771.00 + 2 full barrels filled with nonperishable food items in the fight against childhood hunger. From employees asking to deduct a certain amount from their paycheck to go towards Scruff 4 Schools each week, to a veteran who donated his entire week's paycheck to the cause, the generosity of the H&M Trucking team will provide many meals to feed children in need in Nebraska. "For us, this experience has highlighted just how much our people want to help others. We put the notice out on a Thursday to our drivers, and by the next Monday morning we had already raised over $1,500.00 in pledges. Everyone was excited to see the updates on how much we had raised each week. We had one driver that pledged his ENTIRE PAYCHECK for a week (over $1,000.00) to the program. He’s a veteran, and said he’s seen starving children when he was deployed, and it was the worst thing he’d ever encountered. He wanted to help as many children as he could with this opportunity." said Cyndi Meurrens, Project Solutions Manager at H&M Trucking. "We had other drivers pledging weekly amounts as we offered to deduct their donations directly from their pay. Drivers would call daily for progress amounts and then pledge even more to bump us up over our goal. The office staff wanted to make sure we also filled the barrels – and boy did we ever! They were already overflowing a couple of weeks into the campaign. The results are absolutely amazing, even to us!" Not only did the H&M team surprise Five Nines with their generosity, they seemed to have surprised themselves. Meurrens stated, "It's indescribable! Everyone here is absolutely baffled by our results, and so grateful that we have so many incredibly generous people in the H&M family." "The H&M Trucking team went above and beyond for the 2018 Scruff 4 Schools initiative," said Joel Friesen, President of Five Nines. "We are grateful for our amazing Five Nines staff and partners who embrace the 'We Care' fundamental, and who work hard to better the communities they serve." Our team is humbled by the support this initiative received throughout the month of November. If we have learned one thing, it's that Scruff 4 Schools is not just a Five Nines effort, it's a community effort. We can't wait to see what difference we can make together in 2019.